Elaine will be visiting Juilliard on March 14, 15, and 16 for a series of financial workshops for students. On Wednesday, March 14, Elaine will lead a lunch and learn session co-hosted by the Kovner Fellowship Program and Marks Center. The session will focus on how musicians, dancers, and actors can create spending plans to thrive creatively and financially. On Thursday, March 15, Elaine will lead a session on taxes for recipients of the Kovner Fellowship. On Friday, March 16, Elaine will lead a session on financial planning and creative entrepreneurship for senior dancer as part of their professional practices class. The Alan D. Marks Center for Career Services and Entrepreneurship was established in 2015 by Juilliard trustee Michael E. Marks and his wife, Carole. The center is named after Michael Marks’s brother, the late Alan D. Marks, a Juilliard graduate (BM ’71, piano). The mission of the Alan D. Marks Center is to provide resources, programming, and advisement that will prepare students for a smooth professional transition, allowing them to navigate a successful career in the performing arts and create new opportunities. Established in 2014, the Kovner Fellowship is a merit-based scholarship award that covers the full estimated cost of attendance to The Juilliard School. Kovner Fellows benefit from comprehensive scholarship support covering tuition, room and board, and additional expenses, and by enhanced programmatic content. Juilliard is extremely grateful to Bruce and Suzie Kovner for their pioneering generosity and visionary leadership in establishing this program. 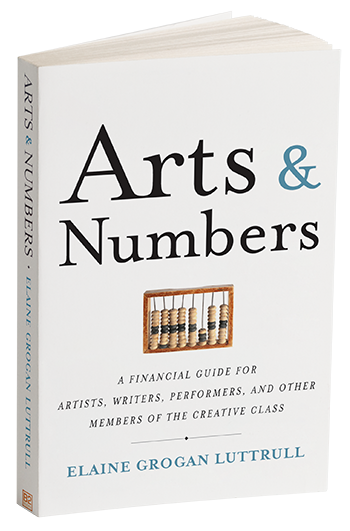 Elaine is the author of Arts & Numbers: A Financial Guide for Artists, Writers, Performers, and Other Members of the Creative Class. She is a CPA and the founder of Minerva Financial Arts, a company devoted to bridging the gap between business and the arts. In addition to serving clients, Elaine teaches at the Columbus College of Art and Design where she runs the Business & Entrepreneurship Department for its students. Elaine’s presentations have been featured nationally by Americans for the Arts, the Foundation Center, Playwrights of New York, the Lark Play Development Center, and the DeVos Institute of Arts Management at the Kennedy Center. Her presentations are renowned for their accessibility and relevance, particularly for creative entrepreneurs.